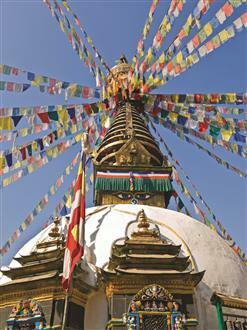 Nepal seems to have it all: magnificent snow capped mountains, tropical jungles, and a rich and varied history and culture. Navavarsha: The Nepalese New Year\'s Day usually falls in the second week of April. i.e. the first day of Baisakh. The day is observed as a national holiday. The people celebrate it with great pomp and show. On this occasion, Bisket Jatra is held in the city of Bhaktapur. Baisakh Poornima (April – May): As Nepal is the birthplace of Lord Buddha, the Lights of Asia, the triple anniversary of the Buddha\'s birth, enlightenment and death is observed with many colorful ceremonies on this day. 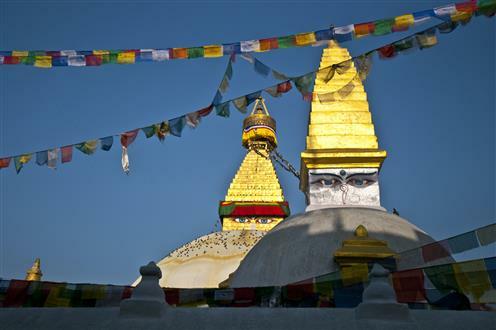 People celebrate the occasion with great veneration paying homage to Buddha at places like Swayambhunath and Lumbini. Red Machchendranath Rath Jatra (May - June): This festival is the biggest socio-culture event of Patan. The wheeled chariot of the deity known as Bungdyo or red Machhendranath is prepared at Pulchowk, and dragged through the city of Patan in the several stages till it reached the prescribed destination (Lagankhel). The grand final of the festival is called \"Bhoto Dekhaune\". A similar kind of chariot festival of Machhendranath (white) is also held in Kathmandu City in the month of March-April. Dumji: It is celebrated in Sherpa Settlements in the month of July. Gaijatra (Cow festival) (July – August): This carnival-type festival lasts eight days. Dancing, singing and comedy are its highlights. Those people whose family members have died during the years send out persons dressed up as a cow to parade the main streets through the city on the first day of the festival. Krishnastami (July - August): It marks the birthday of Lord Krishna, one of the incarnations of Lord Vishnu. On this day, an impressive ceremony at the Krishna Temple in Patan takes place. Indrajatra (August - September): The festival of India, the god of rain, is observed with great enthusiasm in Kathmandu Valley. The chariot of Kumari, the living Goddess, is taken out in procession through the main street of Kathmandu. The festival is specially noted for the echoes of drums and dancing feet of the masked dancers almost every evening. Dashain or Durga Puja (September – October): The Dashain festival is the most important festival of the Nepalese. It takes place some time in the month of September-October. Birgunj is the main entry point to Nepal for Indian tourists especially coming from Calcutta and Patna. Birgunj which is about 210 kilometers away from Kathmandu. There are four climatic seasons: March - May (spring), June - August (summer), September - November (autumn) and December - February (winter). Although Indian currency is valid in Nepal (at an official exchange rate of 1.60 Nepalese rupees to 1 Indian rupee), the Rs. 500 and Rs. 1000 currency notes are not acceptable. Carrying 500 and 1000 Indian rupee notes is a punishable offence in Nepal. Be sure to keep all currency exchange and ATM receipts as they are required at the airport bank to convert back to your original currency. Foreign currencies must be exchanged only through the banks or authorized foreign exchange dealers. Cholera, Diphtheria, Hepatitis “A”, Hepatitis “B”, Jap. B. Encephalitis, Polio, Rabies, Tuberculosis(TB), Tetanus, Typhoid Fever. Nepal is 5.45 hours ahead of GMT. Power supply throughout is 230 volts. All foreign nationals, except Indians, need visas to enter Nepal. Multiple entry visas for 15 days (US$ 25 or equivalent convertible currency), 30 days (US$ 40) or 90 days (US$ 100) can be obtained from any Nepalese embassy or consulate. You can also get a visa on arrival at the Tribhuvan International Airport, Kathmandu or at the Immigration Office at the entry points of Nepal.Tourist visas can be extended for a period of 120 days at the Immigration.